The Maine State House in Augusta was completed in 1832. Designed by renowned architect, Charles Bulfinch, who also designed the Massachusetts State House and the U.S. Capitol Building in Washington, D.C., the new Maine State House took three years to complete. Bulfinch’s plan combined the outline of the Massachusetts Capitol Building with a Greek Revival simplicity which could be executed with local Maine granite. Major remodeling and expansion completed in 1910 established the current appearance of the State House, based on designs by G. Henri Desmond. The length of the building was doubled to 300 feet. To sympathize with the grander proportions of the larger building, a new, much higher steel-structured and copper-covered dome, rising to a height of 185 feet, was built to replace the original cupola. It was topped by a gold-clad copper statue, “Lady Wisdom”, designed by W. Clark Noble of Gardiner. Over time, weather damage and holes caused by hail strikes in the dome caused leaks that threatened the building below. Seams between copper sheets also caused problems for the underlying steel and concrete structure of the dome. This deterioration led to the commitment to replace the copper dome and restore the 13 foot-tall, gilded Lady Wisdom statue for the first time since 1910. Under the direction of Maine’s Legislative Council, the dome’s structural system and framing were analyzed by Becker Structural Engineering a year in advance of dome construction so that Consigli, the general contractor, could create a 3D model staging plan. In collaboration with The Heritage Company, EverGreene Architectural Arts, E.S. Boulos Company and ACE Corporation, Consigli has completed replacement of the entire copper dome, including installation of expansion joints, repair to prevent water infiltration and restoration of the cupola with a highly durable paint system. Also included are lighting upgrades; new LED lights installed in the statue’s torch will last for 30 to 50 years. 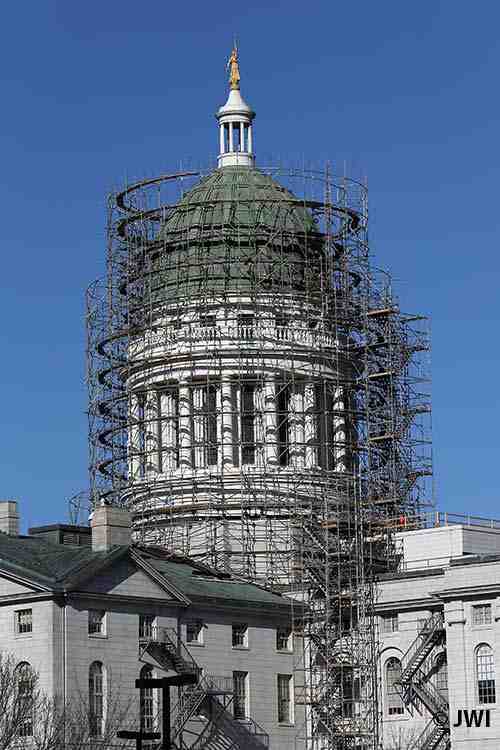 Working 200 feet in the air on elaborate staging, carpenters, coppersmiths, engineers, and other construction workers have made historic changes to the exterior appearance of the State House. The replacement of more than 7,000 square feet of copper covering the dome has dramatically changed the way it looks now and will look over the next 30 years as the copper slowly oxidizes to green. The re-gilding of the 13-foot Lady Wisdom statue atop the dome is brighter and its detail preserved. For the restoration of one of Maine’s most significant historic landmarks, which returned the signature copper dome and gilded Lady Wisdom sculpture to their original intended condition, Maine Preservation is pleased to present the State of Maine, The Legislative Council and Maine State House Dome project team with a 2014 Honor Award for Restoration.